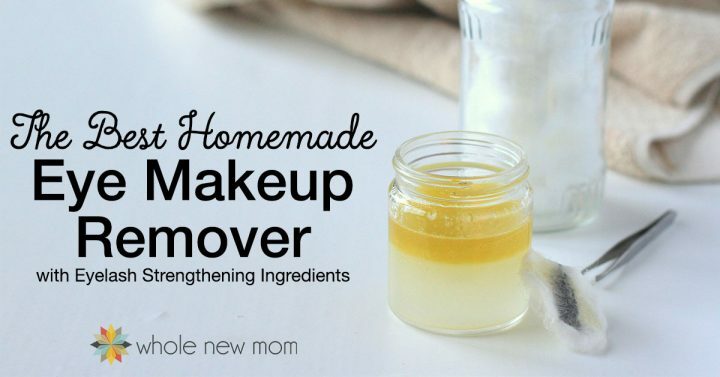 More than 3 years ago I shared my recipe for Homemade Eye Makeup Remover. 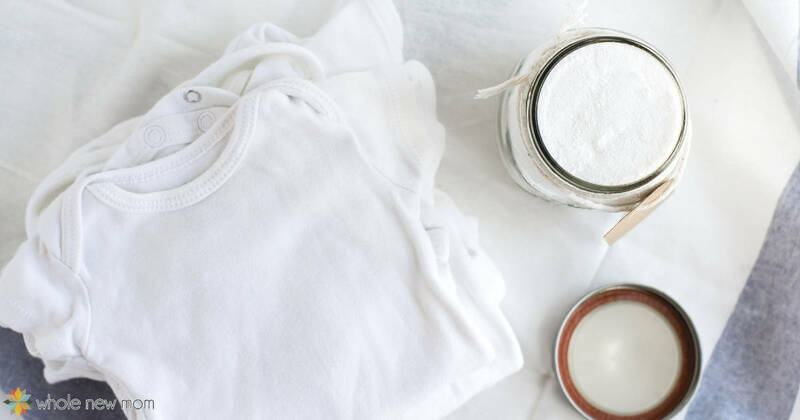 I'd been a “Cover Girl” gal for years — basically because I had super-sensitive skin and found a few OTC cosmetic items that didn't make me break out (most of the time) and well, I really didn't think about the toxins that I was putting on my skin. Now that I think about it, I almost shudder at the thought. 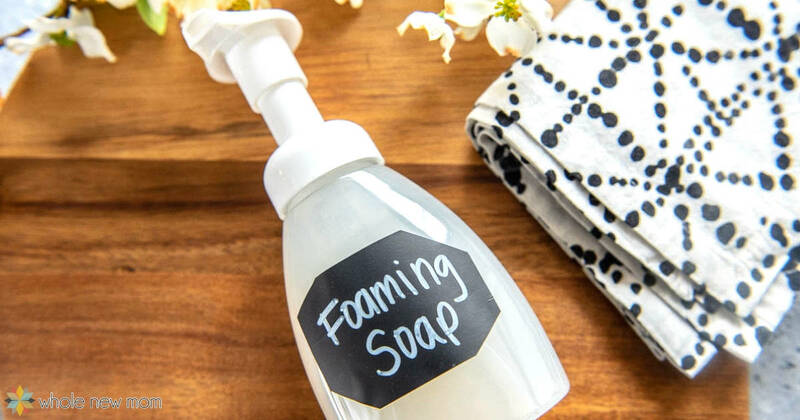 Thankfully, over the years I've replaced most of the toxic things I was using in my home and on my body, with things like my Homemade Jojoba Face Wash, Amazing No-Streak Glass Cleaner, Easiest Baby Wipes, Homemade Foaming Soap, and Easy Natural Dishwasher Rinse Aid. Anyway, in the healthy living circles that I run in sometimes, there are, of course, those who don't wear makeup at all, and those who use coconut oil for just about everything. Well, I do wear makeup, and coconut oil and my skin don't always get along. Did you know that coconut oil is comedogenic? That means it frequently causes acne. And for me, putting coconut oil on my eyes left them feeling greasy — and make it not that easy to apply makeup the next day. I was looking for something better, and I found it. So in 2012, I sought out to find a new way to get my eye makeup off – sans the toxins and while saving money too. I tried a bunch of recipes and really hit the jackpot with this recipe, and have heard from many people about how great it works. But I did think it needed a few improvements for skin health. 1. Add ingredients to your container / dispenser. 3. Wipe on closed eyelids with clean fingers, or moisten cotton ball / makeup pad / cotton round and swipe over closed eyelids. To clean up stray makeup on face, put a tiny amount on fingers or dip cotton swab in mixture and clean. When washing face afterwards, make sure to get some cleanser on your eye area if you wish to remove the remaining oily residue. I guarantee you will love how this works. 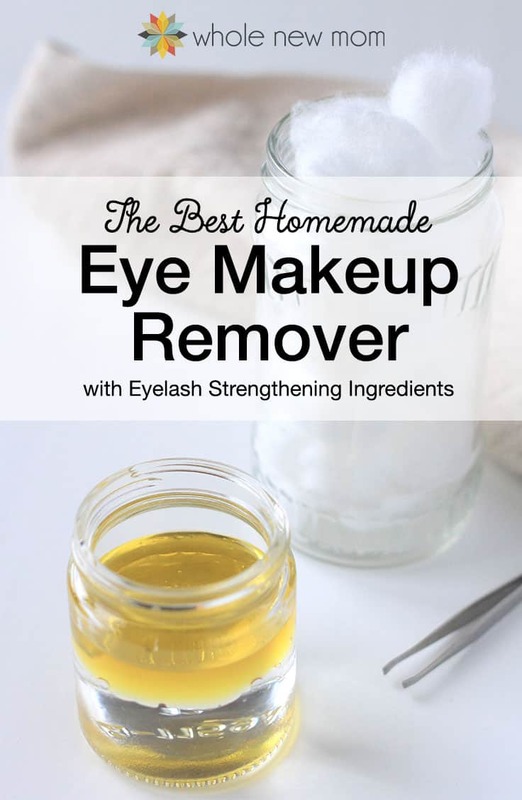 Don't feel like making your own Eye Makeup Remover? Here are a few options for you. 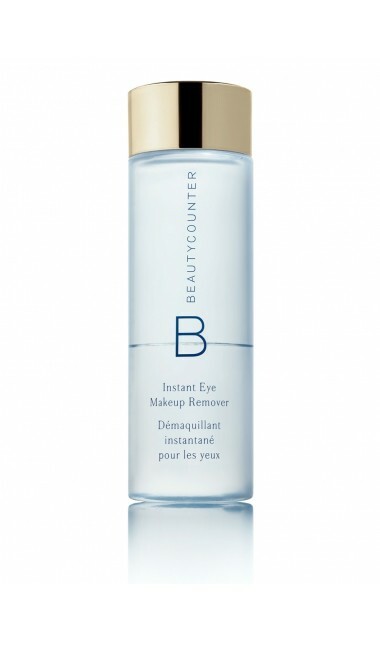 This Instant Eye Makeup Remover from Beautycounter has been raved upon. It contains zero toxins and easily removes makeup. This Baby Oil from Beautycounter is very convenient as an Eye Makeup Remover plus it has no harmful additives like most Baby Oils on the market. 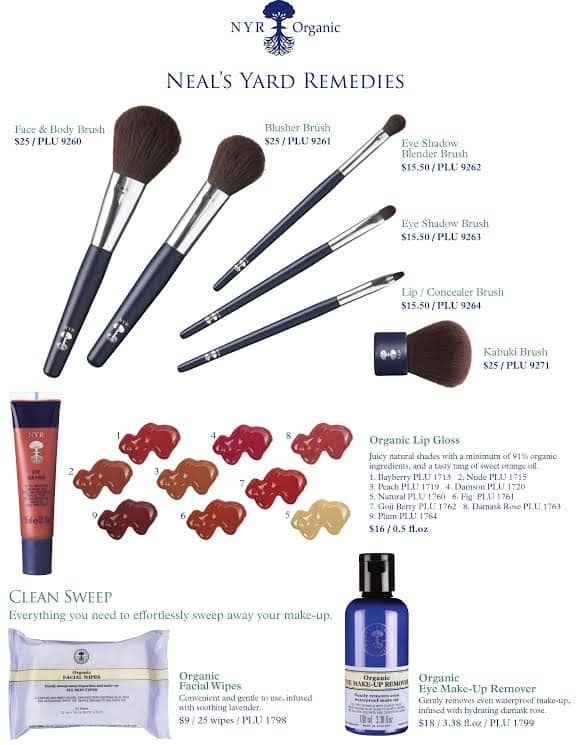 Here is a great Organic Makeup Remover from the company whose products I love – Neal's Yard Remedies. Their Organic Makeup Remover is in the bottom right of the image – and you can see some of their cosmetic options there as well. It literally is the best store-bought makeup remover that I have ever used. I haven't tried tons, but I LOVE this. I don't need a lot and it lasts a long time. And while we're on the topic of Eye Makeup, please do make sure that you are using non-toxic products on your eyes. They are a very sensitive area of your body so it's especially important. I have been through a lot with different companies, finding out that many are not being honest about what is in their products. From ingredients not being listed on the labels to missing ingredients that ought to be there. There can even be high levels of heavy metals in cosmetics and beauty products, so be careful! I personally use and love Beautycounter for my cosmetics. They test every batch of products and they have very strict standards. AND their products are just gorgeous. You can read more about what I love about Beautycounter here. Note about the witch hazel: The one I link to has a small amount of a preservative. There are plenty of other alcohol free witch hazels – they all (from what I can tell) have additives like rose water, aloe vera, etc. What do you use to remove YOUR eye makeup? This looks awesome! I’ve been using coconut oil to remove eye makeup, but it’s a bit heavy and I’ve wanted to make something different for a while! I have everything on here but the oil. Think olive oil or grapeseed oil would work in place of the almond or jojoba? Yes, you could for sure do that. 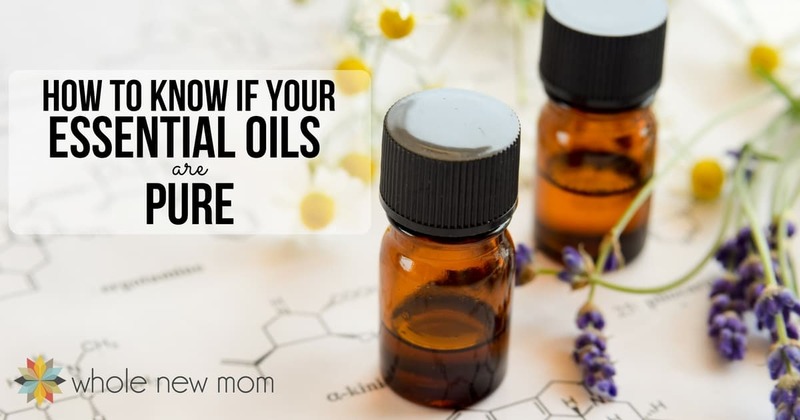 The essential oils company that I link to in the post is offering 10% off their carrier oils right now. Try castor oil as the “oil of choice”-does wonders for your eyelashes! I have been making my own body care products for the past few months with some of my girlfriends. Great fun. We were going to make a shaving oil that called for Vitamin e. I bought what I thought was pure vitamin e. The label reads skin oil, vitamin e acetate. I researched vitamin e acetate, and found that it should not be used on the skin as it can be very irritating. Other than vitamin e capsules can you buy organic vitamin e? Hi, I use castor oil on my hair about once a week. I lost a lot of hair due to a health issue. I only put it on my scalp and I usually do it at night. I use an old mascara wand to apply it to slightly damp hair. I just dunk it in the oil and then just put the wand by the roots and wiggle it back and forth a coupke of times. I work in about 1 inch sections so it can take a while. But if you ate in a hurry, hair in a top knot and then run the wand perpendicular to the knot all around. Then massage your scalp. Be sure to use an couple of old pillow cases if you sleep with it or use some sort of head wrap. Use an old WIDE tooth comb to comb it through before washing. This is key number one. I have curly hair so I live by the wide tooth comb to prevent breakage ans hair loss. You have to get your hair really, really wet before shampooing. Then shampoo. The key to castor oil is a little goes a long way that’s key two. Third key is slightly damp hair and really dirty hair. Oh I almost for got.. while you already putting the oil on make sure you are periodically combing your tangles out and do a good combination before putting it in a loose top knot. It really does wonders, especially with curly hair since I use shampoo that has sulfates in it (the no sulfate stuff leaves my hair greasy) Hope this helps if you ever try it again. Thanks – perhaps I will – but does it come out? I felt I had to do about 3 washings before it even felt like it was partly out. Actually my hair appears to be growing quite well now so I will have to do another post about what I am doing. It does come out, but do expect to feel just a little bit of oil. Since my hair is curly, it’s drier so I need the oil to help with the frizz. You might want to try a clarifying shampoo. I just use my regular one and really scrub my scalp. Your hair will feel like it still has oil on it but it’s really just moisturized. My hair gets super soft. I use Nature’s Gate organic conditioners (made in USA, imported all the way to South Africa) so hopefully there are sulphate-free shampoo and silicon-free conditioner options wherever you may be. I’m totally one of those coconut oil junkies! It combined with raw honey is miraculous on my acne prone skin. But I know exactly what you mean about it feeling heavy on the eyelids. My eyelids are so sensitivities. I’m definitely going to give this recipe a try! Thanks! I wish I could use coconut oil on my skin – it just doesn’t work for me. :(. Coconut oil isn’t fond of me either. I would like to make this. Is there a one-stop shop I can get all these ingredients? Like a Vitamin World? I’m not sure – sorry! I haven’t been to that store. HI Adrienne, I have tried so many mascaras 🙁 – and the skin on the outside corner of each eye seems to get red and raw after I wear mascara for the day. If I try Ava Anderson and get the same reaction and/or it flakes off too much what is the return policy? Does it come in brown/black? Hi Shirley. I’m so sorry you’ve had that problem. Have you been able to pinpoint the ingredient that is causing it? Have they been all / almost all natural? The return policy is 30 days and after that they will do an exchange. It only comes in black, but I have always been a “brown / black” gal and I don’t feel that it is too harsh on me and I am very concerned about that. I have a very small jar of vitamin E oil. How much would be equal to 2 capsules? I can’t wait to make this! Hmmm…looks like 1/4 tsp should be a fair approximation for a larger capsule. I’ll add that to the post. Thanks and hope you enjoy it!